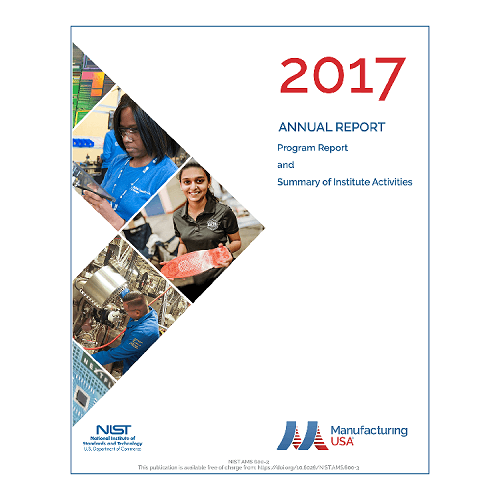 The Manufacturing USA Annual Report for 2017 describes the program’s work in moving discoveries from the Nation’s universities and research laboratories into production in the U.S. It also describes the program’s fourteen institutes successes in developing world-changing manufacturing technology and equipping the U.S. manufacturing workforce with the high-value skills needed to make tomorrow’s products. The annual report incorporates material from the 2017 Program Report (available here) submitted to Congress yesterday and includes additional information about the major accomplishments of the Manufacturing USA institutes in Fiscal Year 2017.